When I was a kid, at about the age when I felt my first stirrings of sexual awareness, I came across a rather curious object. It was a pen. It had a picture of a woman in a bathing suit on its side. The curious thing was that when the pen was held upright, as it would be in use, the woman´s bathing costume slid down revealing her naked figure beneath. As far as I was concerned, this was an invention as awe inspiring as any I could imagine. It was right up there with the great pyramids of Egypt and the hanging gardens of Babylon. The human imagination is capable of great things and the “swimming costume” pen was testimony to our creativeness. It so happens now that the education people are worried about the widening “gender gap” between the academic performance of boys and girls. Simply stated, boys are losing ground. In particular there is a great reluctance among boys to engage in lengthy written tasks like essays. Their written work is cursory and minimalist, arguments lack depth and detail. Boys, it seems, are reluctant to pickup a pen while girls are sailing away, leaving the boys in their wake. Committees of concerned educators have been assembled to tackle the problem. I have attended meetings myself at school, over the years, where this matter has figured on the agenda. To me it is a no brainer. Just give each of the boys one of these “swimming costume” pens and the gender gap will begin to narrow straight away. The Education Secretary in the UK, Michael Gove, is an unpopular figure. Maybe I will send him my suggestion. That way, at least, he can take some credit for solving a seemingly intractable problem. My daughter Pippa, mindful of my juvenile sense of humour, once considered getting me a gift of something she had seen online. It was a pencil sharpener in the form of the rear end of a cat as seen from behind. The animal´s tail was raised vertically revealing the “opening” into which the blunt pencil is inserted. This clever apparatus is clamped to the desk or bench for convenience. Again, a brilliant and useful device and further evidence, as if any were needed, of human inventiveness. I am discussing these clever inventions because I myself have come up with a brilliant invention of my own. It may lack the “class” of the SC pen and the cat´s arse sharpener but it could prove to be useful. 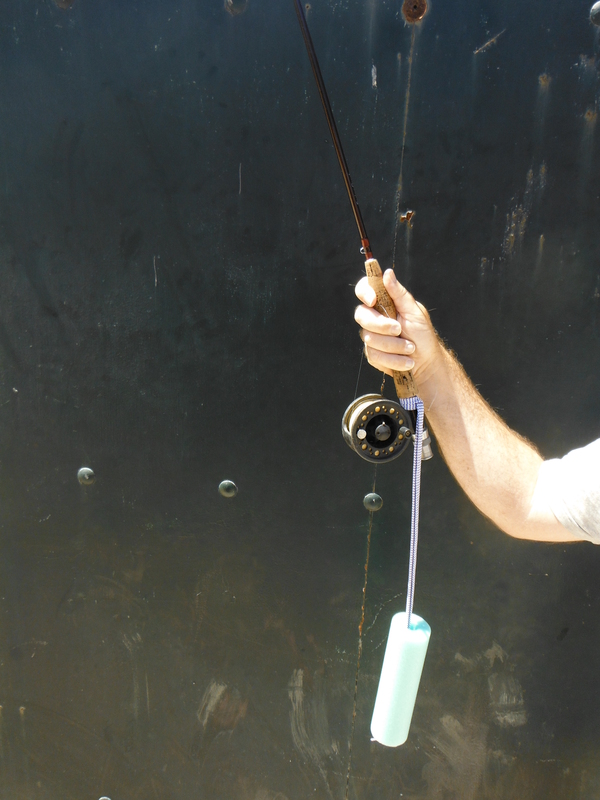 The invention is designed to solve a potential problem on our forthcoming fishing trip; rods and reels tipping overboard and sinking to the bottoms of reservoirs. This happened to me last September and I still wake up at night in a cold sweat visualising the descent into the gloomy depths of my favourite 10 foot 4 weight fly rod after it had vanished overboard from my float tube while I was unhooking a fish. My soon-to-be patented invention should stop this from happening again. It is simplicity itself. A short length of low density foam tube is attached to the rod handle at the reel seat. This will hopefully avert accidental loss, and the left over foam can be used to tie up a few poppers for black bass. Those pens were a formative part of my childhood… my parents bought them back from a holiday in the states to what was a very censored South Africa. Ive been scouring the internet for ages looking for one. Id love to hear if anyone knows where i could get one. It´s years since I´ve seen these things but if I come across any I will let you know!